The fact that it’s now officially summer, and therefore acceptable to class strawberry ice cream floats as one of our five a day. Any form of summer activity for the kids that doesn't cost an arm, a leg, and a second mortgage. We quite like our limbs the way they are thank you very much. *We're not saying you should blow the extra money on a tub of Ben and Jerry's, but we're not saying you shouldn't, either. Get creative with all those left-over craft materials! Make it personalised with cut-out photos of the kids in fun poses, as in this example from Handmade Kids Art. Marshmallows raining from the sky is pretty much the stuff dreams are made of, but these work just as well with pom-poms, if you're worried about digging lint-encrusted marshmallows out of the couch cushions for the next week. All you need are plastic cups and balloons to get started! 3 - Get outside and get messy! 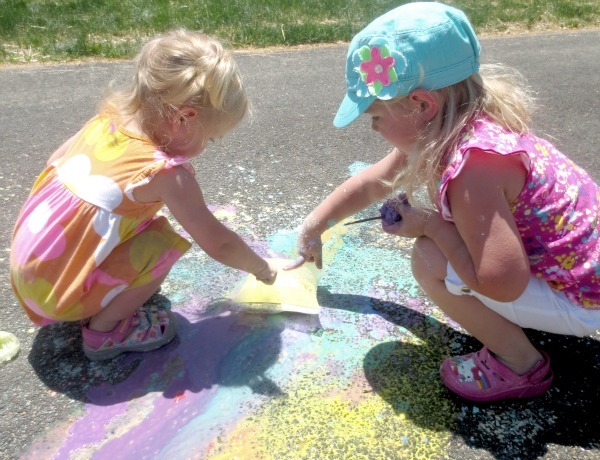 Take the basic ingredients of those foaming volcano experiments from school, add a little cornflour and food colouring, and you’ve got yourself some exploding pavement chalk! 4 - Take advantage of the post! We're all about the snail mail at Weekend Box! Rainy days are the perfect time to write letters to relatives, connect with a pen pal, or send a package of fun stuff - stickers, drawings, bracelets, anything under the weight limit for a letter - to a friend. It's a great way to encourage screen-free communication, practise hand-writing skills, and keep in touch with some distant relatives! 5 - Grab yourself a Weekend Box! With boxes from just £4.95 per box, we've made it easier than ever to get kids making, baking, exploring and more this summer - we dream up the ideas, source the materials, and deliver it straight to your door in a personalised box. Interested? Sign up here, and get your summer sorted!